In 2020, a menacing conflict occurred between the nations around the world, so every politician was thinking about Biological warfare. The first country equipped with the bio-weapons, initiated World War III by release of a biological virus throughout the world. High-scale apocalypse with a gigantic number of casualties was the devastating result of this war. In this apocalypse, you as a zombie killer are survived to live long enough to see the future of human race. Human race is under extinction due to a virus called z0k0. Z0K0 kills people after some times, and then transforms the people's corpse to a zombie. Zombie is a walking corpse without any role of consciousness in it, and this thing is strongly interested in eating the flesh and drinking the blood. The blood of other living things like human... like you. 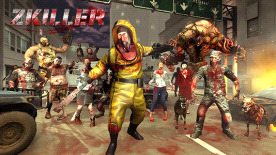 ZKILLER is an astonishing FPS survival horror game which takes place in an apocalypse world where waves of brutal zombies are going to butcher you. As a survivor, kill them all to live long enough. 21+ different types of enemy including human-like zombies and also zombie dogs are strongly ready to bite you in the game. Also, 5+ powerful and frightening bosses are impatiently waiting for you. The zombies are not only brutal and strong but also very smart to find you wherever you hide using a powerful and advanced AI algorithm. The war against zombies occurs at 5+ unlockable environments including Urban City, Subway, Military Base, Space Station, Sci-Fi Laboratory. The maps are fully decorated with a huge number of post apocalypse and bloody objects. The explosive barrels at specified locations of maps are substantial assets to blow up the zombies. Random ammo and health packs at different locations will help you to survive more. Equip yourself with a vast 30+ splendid high-poly realistic and powerful weapons including melee weapons, hand guns, assault rifles, shotguns, light machine guns and grenades. In order to survive, save ammunition as much as possible until refill at the supply pods around the maps. Shoot zombies in the head to enter an advanced slow motion time system and experience the killings slowly. Experience high quality visuals and post processing with realistic lighting, full HD textures, bloom, enhanced contrast/colour and ambient occlusion all running on 60 frames per second. Enhanced particle systems and high quality shadows are boosting the game beyond imaginations. Ultimate metal and hard rock instrumental music in the game will raise your adrenaline to slaughter the zombies enjoyably. Weapons and zombies have high quality 3D sound effects to represent their realistic aspects. Future Development, we want to develop the game further based on the community feedback and opinions. Multiplayer Online? We would love too and you?